See in Glossary and they know how to avoid each other as well as other moving obstacles. Pathfinding and spatial reasoning are handled using the scripting API of the NavMesh Agent. See in Glossary between obstacles and other agents. Height The height clearance the agent needs to pass below an obstacle overhead. Base offset Offset of the collision cylinder in relation to the transform pivot point. Speed Maximum movement speed (in world units per second). Angular Speed Maximum speed of rotation (degrees per second). Acceleration Maximum acceleration (in world units per second squared). Stopping distance The agent will stop when this close to the goal location. Quality Obstacle avoidance quality. If you have high number of agents you can save CPU time by reducing the obstacle avoidance quality. Setting avoidance to none, will only resolve collision, but will not try to actively avoid other agents and obstacles. Priority Agents of lower priority will be ignored by this agent when performing avoidance. The value should be in the range 0–99 where lower numbers indicate higher priority. 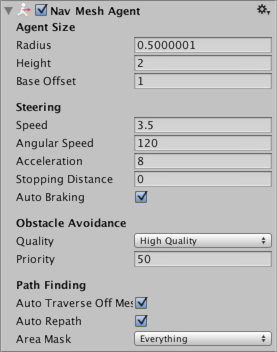 Auto Traverse OffMesh Link Set to true to automatically traverse off-mesh links. You should turn this off when you you want to use animation or some specific way to traverse off-mesh links. Auto Repath When enabled the agent will try to find path again when it reaches the end of a partial path. When there is no path to the destination, a partial path is generated to the closest reachable location to the destination. Area Mask Area mask describes which area types the agent will consider when finding a path. When you prepare meshes for NavMesh baking, you can set each meshes area type. For example you can mark stairs with special area type, and forbid some character types from using the stairs. See in Glossary’s anchor point is not at the base of the cylinder, you can use the Base Offset property to take up the height difference. The height and radius of the cylinder are actually specified in two different places: the NavMesh bake settings and the properties of the individual agents. NavMesh bake settings describe how all the NavMesh Agents are colliding or avoiding the static world geometry. In order to keep memory on budget and CPU load in check, only one size can be specified in the bake settings. NavMesh Agent properties values describe how the agent collides with moving obstacles and other agents. Most often you set the size of the agent the same in both places. But, for example, a heavy soldier may have larger radius, so that other agents will leave more space around him, but otherwise he’ll avoid the environment just the same. Creating a NavMesh Agent – workflow on how to create a NavMesh Agent. Inner Workings of the Navigation System - learn more about how obstacles are used as part of navigation. NavMesh Agent scripting reference - full description of the NavMeshAgent scripting API.